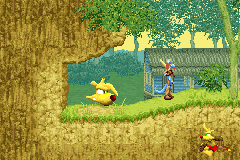 GBA Ty the Tasmanian Tiger 2: Bush Rescue (USA/Europe) in 14:58.41 by Mittenz & The8bitbeast. Boss Cass has broken out of prison, and the Bush Rescue organization is formed to stop his evil plans. Ty gains access to boomerangs with various properties that he can use on his missions. In this run, Mittenz and The8bitbeast use boomerangs in unintended ways. Among other effects, this enables Ty to reach speeds beyond normal limits, allowing out-of-bounds movement and skips of large parts of levels.